Bathroom remodels can be extremely rewarding and fun for pros and homeowners. Because a bathroom is usually a small space, you can truly transform the room no matter the project budget. ProSource® of San Luis Obispo features bathroom products that fit all types of bathroom remodel styles. When you visit our showroom, you can explore our range of bathroom fixtures and use our staff as a sounding board for your specific bathroom project. We can talk through your initial concept with you and recommend products that might make your design blueprint into a reality! 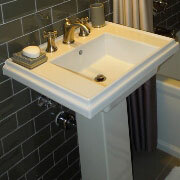 ProSource of San Luis Obispo features all different types of bathroom sink products. Whether you are looking for pedestal, shroud, standard, vessel, or wading pool styles, ProSource of San Luis Obispo has the type of sink for your project. You can also choose the shape that best fits your bathroom project, the material, installation type, and more. 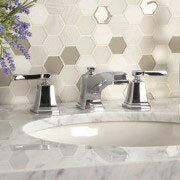 Your bathroom remodel is not complete until you have the perfect bathroom faucet to compliment the space. Our extensive catalog includes wholesale sink faucets in brass, bronze, chrome, stainless steel, and more so you can match the color with the sink. Additionally, you can select the features you desire in your sink handle, including number, centering, length, and type. The shower is an oasis for the bathroom. Whether your client wants it to be a traditional and affordable project, with the classic white subway tile and a reliable shower head, or maybe a more luxurious and customized shower with stone floors and multiple shower heads, ProSource has the projects to easily create a rejuvenating shower space. 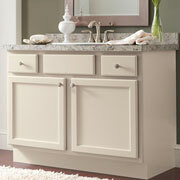 The vanity is a space-saver in many bathroom remodeling projects. Not only does the vanity usually hold the sink and accentuate the mirror, it can be additional storage space with extra cabinets and drawers. A vanity is as useful everyday as other elements of the bathroom. Vanities are a great way for your client to express their personality, choosing a vanity with a character to match. The bathtub is a place to go to relax or to bathe little kiddos. 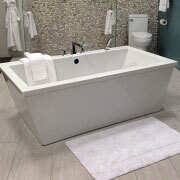 ProSource can provide the perfect tub for your remodeling project. We offer tub-shower combos, freestanding tubs (especially with that vintage clawfoot), corner tubs, and jacuzzi tubs… just to name a few. Choosing the toilet is more than just another part of a bathroom remodel project. 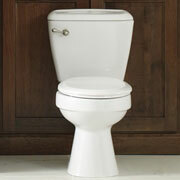 It means choosing a throne based on flush ratings or style of handle, seat material or bowl size. There are many features that make choosing a toilet a valuable part of a bathroom.